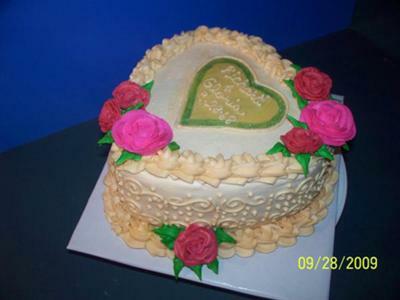 To make this anniversary cake, I used a heart shaped cake pan and one cake mix. Bake according to directions and let cool completely. I iced with ivory colored buttercream. Let crust over a bit and smooth with a Viva paper towel. I used a really big star tip to do the top and bottom borders, and I used a small piece of fondant for the heart in the center. Then I used a bit of green dusting powder around the edge. I made buttercream roses. I'm not good with them yet. I had trouble placing them where I wanted...so I filled in my mistakes with leaves. Your cake is amazing. It is very talented. I don't see any mistake it is perfect. Nice roses.